A while back I wasn’t feeling great and so I was seeing an acupuncturist. She told me about consuming burdock root as it has strong medicinal benefits. Wikipedia agrees, and no one denies Wikipedia! 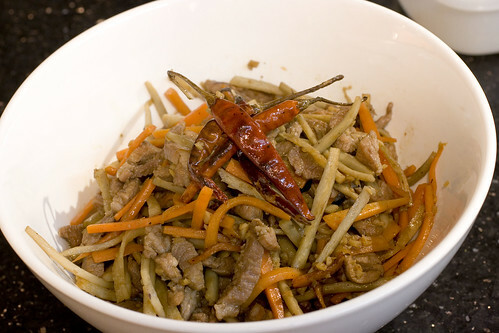 So Jessica’s mom made me a delicious dish of Shredded Pork with Burdock Root. 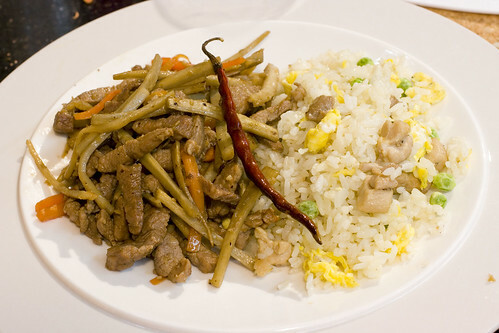 Recently, I’ve been having a hankering for that dish again, it was so good. Tonight I tried to reproduce it and I think I got pretty close! The trick to this dish is to julienne the veggies and pork as fine as possible. I’m not great at that, but I gave it a shot. I recommend that when you make this, make your veggies a bit finer than mine. 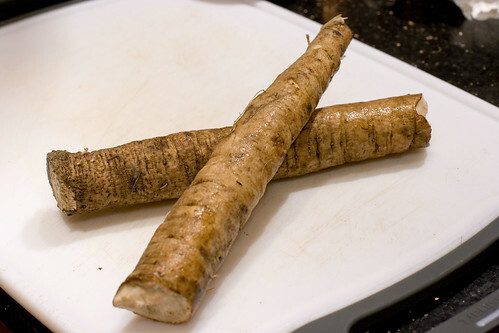 If you haven’t worked with burdock root before, basically treat it like a carrot. Peel the outside with a vegetable peeler and rinse it. Then while cutting it, keep the pieces in acidulated water. Make sure to strain out the water before frying. 1. Over high heat, add oil and chilis to a large wok. Once the chilis start to blister, add the burdock root. Stir and keep the wok moving. Cook the burdock for about four minutes until burdock starts to darken and gets softer. 2. Add carrots and continue cooking another minute or two until carrots soften. Remove veggies from wok and reserve. 3. 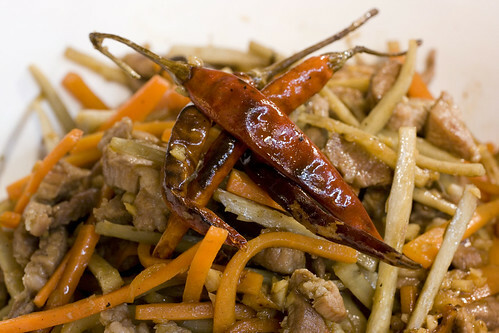 Add pork to hot wok, season well with white pepper. Once pork starts to sear add soy sauce. Once pork is cooked rare, remove any excess fat and add garlic and ginger. Cook another minute. Add reserve vegetables and vinegar. 4. Continue cooking until pork starts to caramelize and you can really hear the wok sizzling. Remove the chilis and use as garnish. Serve hot with rice. posted by Lon	at 09:02 AM	Filed under Basics, Chinese, Recipes. You can follow any responses to this entry through the RSS 2.0 feed. Both comments and pings are currently closed. omgosh! my mom made something like that just the other day! i love burdock root! How neat! I’d never heard of it! just wanted to thank you for this dish. I had never heard of this root before but am glad to have found it. I found it by opening up my newsletter from Gweneth Paltrow, I am on her blog called “GOOP”. very interesting. Anyway, I just thought I’d pass that on to you. Thanks for taking the time to display your recipe so nicely. 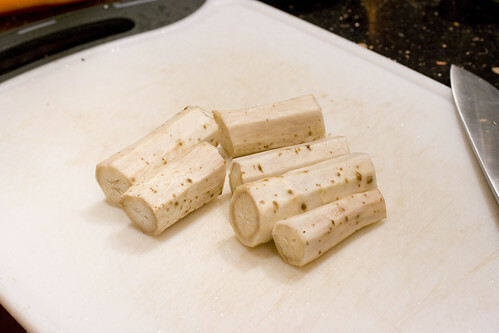 how about burdock root soup receipe?? anyone..
FeatherJack, always better when you’ve grown your ingredients! I wish we could.